Amsoil is about no compromises. We have the right oil and filter for you machine. There is a powersports lookup guide, and and a two cycle application table to help you find the best product for your machine. For the best prices please go here. AIT INTERCEPTORâ„¢ High Performance Synthetic 2-Cycle Oil (AIT) A high-performance two-cycle oil with a performance emphasis on exhaust power valves. Excellent for all types of snowmobiles, motorcycles, personal watercraft, ATVs and jet boats. Contains high levels of detergent additives to prevent valve sticking. High quality replacement for manufacturer branded oils. Injector use or 50:1 premix. Use where the following standards are specified: JASO FC, API TC . 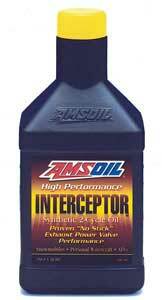 AMSOIL AIT INTERCEPTOR Synthetic 2-Cycle Oil is recommended as an injector oil or at a 50:1 mix ratio in carbureted, electronic fuel Injected (EFI) and direct fuel injected (DFI) snowmobiles, personal watercraft, motorcycles, ATVs and jet boats, including, but not limited to, those manufactured by Bombardier , Yamaha , Arctic Cat , Polaris , Kawasaki , Suzuki and Honda . 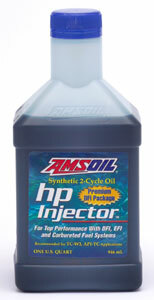 HPI hp Injector Synthetic 2-Cycle Oil (HPI)Excellent for all outboard motors with a performance emphasis on modern direct fuel injected (DFI) technology. Also recommended for personal watercraft, jet boats, motorcycles, snowmobiles and ATVs. Injector use or 50:1 premix. NMMA TC-W3, API TC. hp Injector is recommended for use in all two-cycle outboard motors including, but not limited to, Mercury EFI & Optimax , Johnson and Evinrude FICHT and E-TECâ„¢, Yamaha HPDI, Nissan and Tohatsu TLDI , Suzuki , Mariner and Force . Also recommended for use in all two-cycle personal watercraft and jet boats, as well as snowmobiles, motorcycles and ATVs. Use as injection oil or as 50:1 pre-mix (2.6 oz. per U.S. gallon of gas) where NMMA TC-W3 or API TC oils are specified. Compatible with mineral and synthetic TC-W3-type two-cycle oils, however, mixing two-cycle oils should be minimized. 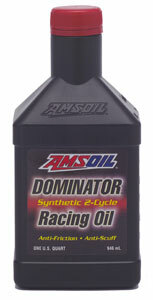 TDR "Dominator" 2 cycle racing oil Racing 2-cycle oil with an emphasis toward high-horsepower and modified racing or trail motors. Contains higher viscosity base oils for best overall protection and additives for higher operating temperatures. Injector use or 50:1 pre-mix. For snowmobiles, motorcycles, ATVs, PWC, go-carts and racing outboard motors. DOMINATOR is recommended for use in high performance stock or modified two-cycle motors, including air or liquid cooled snowmobiles, personal watercraft, motorcycles (Moto X), ATVs, go-carts and outboard motors*. Good for use with coated or non-coated pistons, high-octane racing fuels and exhaust power valves. Compatible with most other two-cycle oils, however, mixing oils should be minimized. Use at 50:1 pre-mix ratios (2.6 oz. oil per U.S. gallon of gas) or as injection oil where JASO FC or API TC oils are specified. Not suitable for use with alcohol or nitro-methane fuels.